Connecticut has passed a law requiring Marketplace to collect a remit sales tax on sales facilitated through that marketplace effective December 1, 2018. Amazon began this collection on December 1, 2018. Walmart began this collection on December 1, 2018. Etsy began this collection on February 1, 2019.
eBay began this collection on April 1, 2019. You can view the state's guidance document here. As a result, if you have never collected sales tax in Connecticut, you'll now see now see sales tax collected in Connecticut on your TaxJar Dashboard. If you are currently opted in to receive email reminders for your sales tax due dates, you'll also see Connecticut listed as a state where you have an upcoming return due in those emails. Do I need to register for a sales tax license in Connecticut? If you sell on Amazon, you can check to see if you have inventory-related nexus by checking your State Settings page to see if there is an Amazon Badge listed next to Connecticut. If you've imported your sales across all platforms into your TaxJar account, you can determine if you have economic nexus in the state by running the Sales & Transactions Checker. If you do not meet any of the criteria that creates nexus in Connecticut, you won't need to register for a sales tax license in this state. I have already registered for a license in Connecticut but and all of my sales are Marketplace-only sales. Should I cancel my existing registration? No. You should contact the DRS via the Taxpayer Service Center and request a change to the annual frequency for sellers whose only sales are through a marketplace facilitator. Do I need to collect taxes on my Connecticut sales on other platforms? If you have nexus in the state (physical or economic) and you make sales to customers in Connecticut on platforms outside of the marketplace that is automatically collecting and remitting, you will also need to collect tax on your end on the CT orders that are processed on the other platforms. Do I still need to file returns in Connecticut? Yes--once you register for a license, you will be required to file a return based on the frequency the state has assigned you. I still need to file returns in Connecticut. How do I do this without paying double tax on the sales that were collected and remitted by my Marketplace? 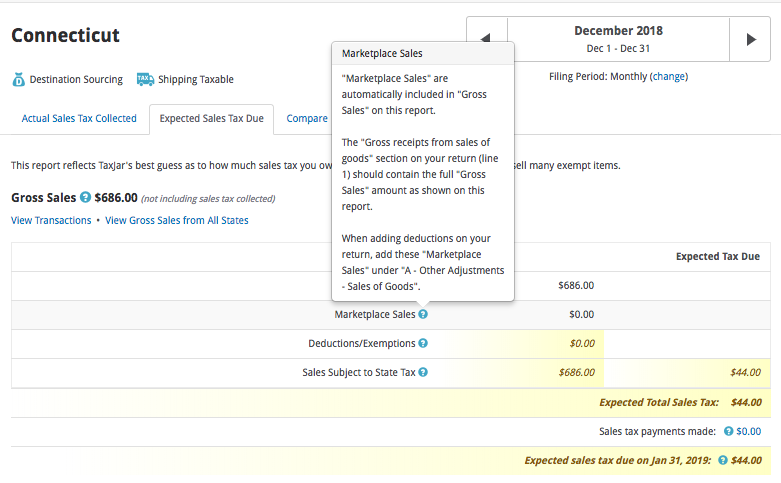 When you file, you'll include the marketplace sales totals in your Gross Sales Total, but you'll exclude the Marketplace sales totals in the deductions section of the return (OS-114) when you file. If all of your sales are Marketplace sales, once you deduct the marketplace sales, you will file a $0 return. If you make sales on other platforms in addition to the Marketplace, you'll need to make sure you remit the tax you collected for those sales when you file. If you're enrolled in AutoFile for Connecticut, our system will handle the Marketplace sales deduction process automatically. How does this affect my TaxJar Report for Connecticut? Your TaxJar Report for Connecticut has been updated to reflect the sales that had tax collected and remitted by Amazon and Walmart. You'll see this change in Connecticut sales tax Reports for periods starting in December 2018 and moving forward.